If you’re familiar with stranded knitting, you’ve probably heard of the concept of colour dominance. I won’t be writing about how holding the yarns determines dominance because there are so many different knitting styles, and so many smart knitters have already written about it more eloquently than I could, but I do want to have a little look at how colour dominance can affect the look of a stitch pattern. 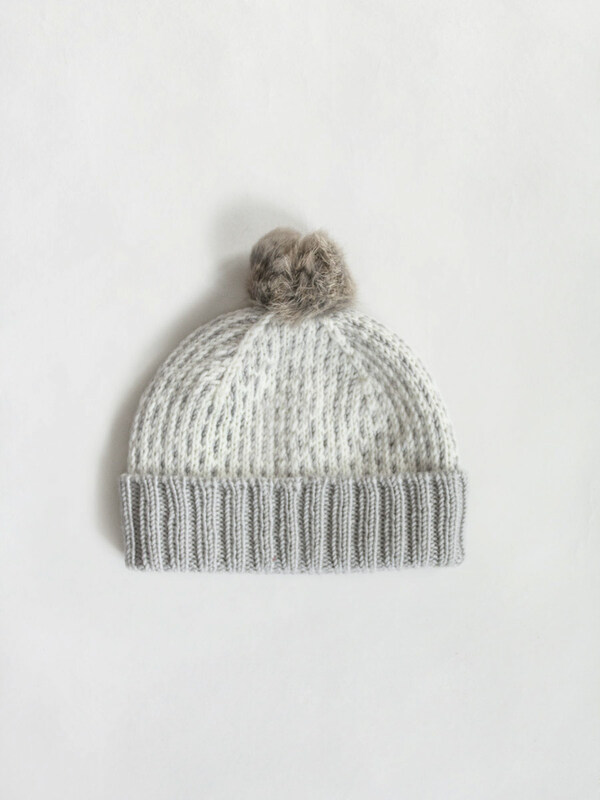 My Dashes hat uses a very simple and small chart, with the background colour, MC, making up the majority of the stitches – but not overwhelmingly so. 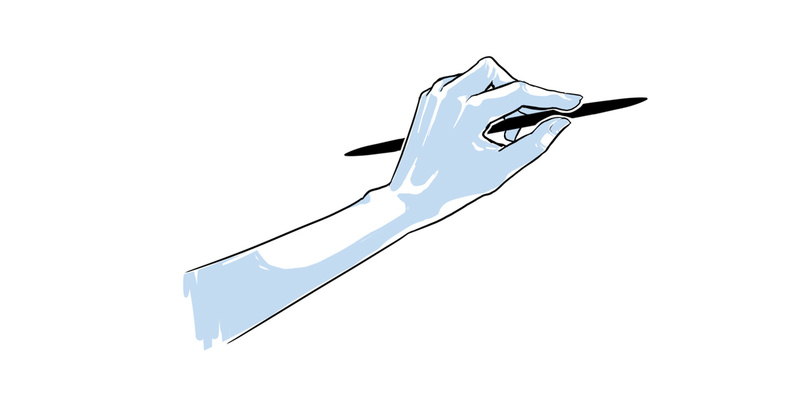 Still, enough for me to prefer holding the MC in my most dextrous finger, which puts the CC behind it and therefore in the dominant position for me. 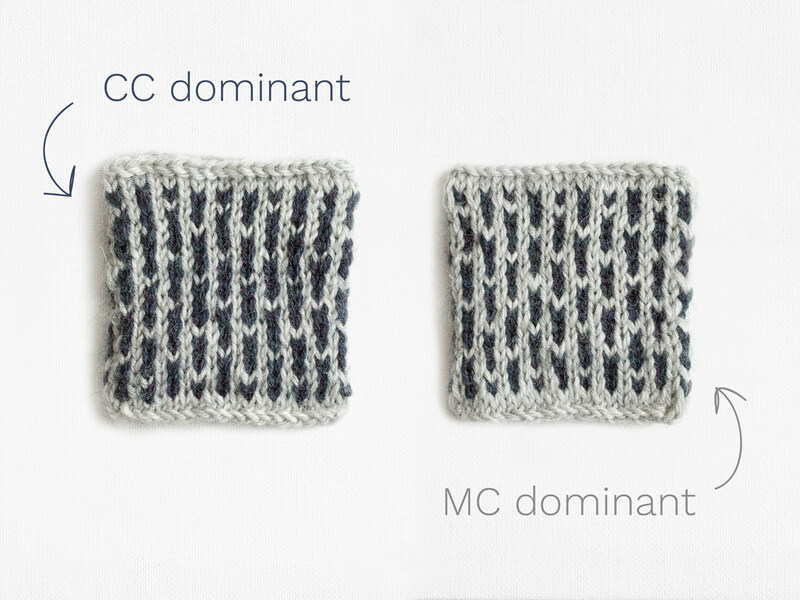 To have a good comparison between MC and CC dominance in this specific stitch pattern, I made this little swatch. Because knitting colourwork flat is the worst, and because you’re meant to swatch in the round for items you’ll be knitting in the round anyway, a swatch like this is a great way to check your gauge and have a look at dominance while you’re at it. For this little experiment I cast on 40 stitches, with 20 stitches on each needle using the magic loop method. 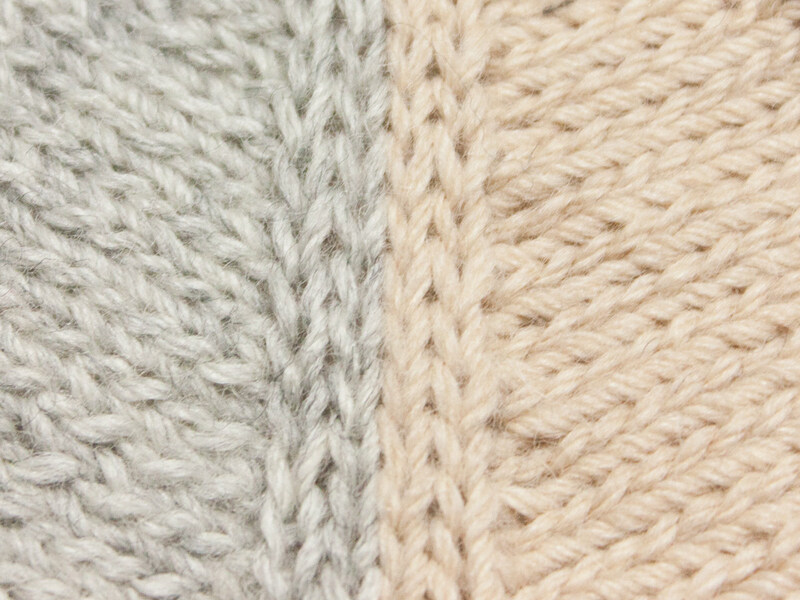 One needle I knit with the MC (background) dominant, and the other with CC (dashes) dominant. For gauge purposes you should definitely knit a bigger swatch than this though! 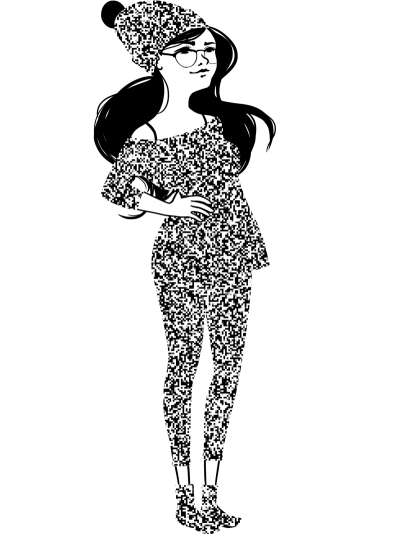 I’m having a hard time deciding whether I prefer the MC or the CC dominant in this pattern. Initially I knit the original hat and the pattern samples with the CC dominant, but during a late-night, last-minute-gift marathon I inadvertently knit one up with the MC dominant. By the time I noticed, I had no more time to frog and re-knit so I was a little bummed out, but once finished, washed and blocked, it actually looked fine, although in the low-contrast combination I used, the dashes disappeared into the background more than I’d hoped. Because the stitch pattern is basically vertical, the stitches get very elongated (did you notice the gauge actually has less rounds than stitches per 10 cm / 4″? ), and knitting with the MC background dominant can make the MC-only columns pop out visibly. A high contrast colour combination will have a different effect than a low contrast one, as will a slippery yarn versus a grabby yarn. I definitely recommend a dominance swatch before starting your colourwork project, and you might as well compare the two while you’re checking your gauge.